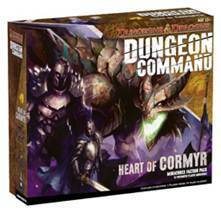 Dungeon Command is the latest D&D based deviation from Wizards of the Coast, and a return to pre-painted plastic miniatures in at least some small form. 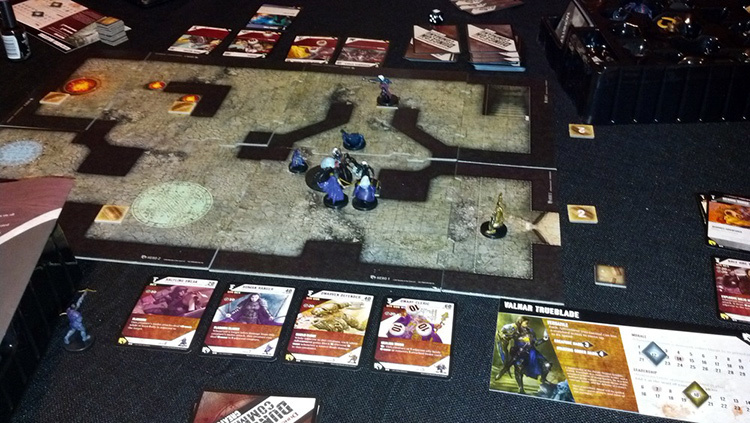 Now I should mention right off the bat that Dungeon Command is a skirmish game, it’s all killer no filler – 100% adversarial combat with lots of D&D flavor. You might look at it and say “this looks like 4e D&D”, which is where you’d be simultaneously right and wrong. 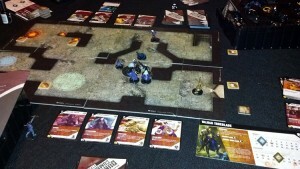 Dungeon command uses dungeon tiles with a 1″ grid, D&D miniatures, and an action economy similar to “Move/Minor/Standard” but it also uses the tapping mechanics and deck building properties from Magic: The Gathering. If you are a fan of either of these games, you’ll probably like dungeon command, if you happen to be a fan of both – you’re going to love it. For the rest who are unfamiliar with one or neither, my guess is that you still might enjoy the hell out of this game. Okay well not just underground, the tiles that come with each dungeon command box are double-sided – one side depicts a dungeon setup and the other a grassy outdoor arena. You and your foe(s) will decide which arena to fight in and which commander to lead your “warband” before each battle. Commanders provide a unique tactic or benefit to your warband such as allowing your units to move further than normal or some other passive benefit. They also govern your starting Morale (basically HP), Leadership value (maximum level total of all creatures you control and can have on the board at once), how many creature cards you can hold in your hand, and how many order cards you begin the game with. Each player has a warband made up of various creatures and characters, a corresponding card for each miniature, and a deck of order cards to use that allows them to pull off special attacks and maneuvers. The order cards are not needed to have your units move and attack, but really act as the bread and butter for most of the gameplay. Some of the order cards are potions, or combat maneuvers, damage deflection, there is really a lot of variation within them. On your turn you’ll untap all your units and draw a card, move and activate each of your units one at a time playing order cards as you go, move your leadership value up a notch and deploy new units (if you can), and untap all of your cards again. This proceeds until the opposing player has lost all of their units, or their morale reaches 0. You can also run around the board unearthing treasures and taking them in order to bolster your morale as well, a fun deviation and yet another layer of strategy. The way things break down is actually pretty simple. You see, each unit has a level, type (basically a keyword – humanoid, evil, drow, etc. ), speed, hit points, and a special ability or trait. Some creatures have a ranged attack, and all of them at least have a melee attack – the damage value and range of each is indicated on their card. You may have any number of units out under your control so long as all their levels total up to your leadership value or less. With leadership increasing every turn, the means that the game only intensifies as it goes on. The order card mechanics are pretty simple too, in addition to their level, each unit has at least one ability score that they excel in, and each order card specifies which ability score it must be played in conjunction with. 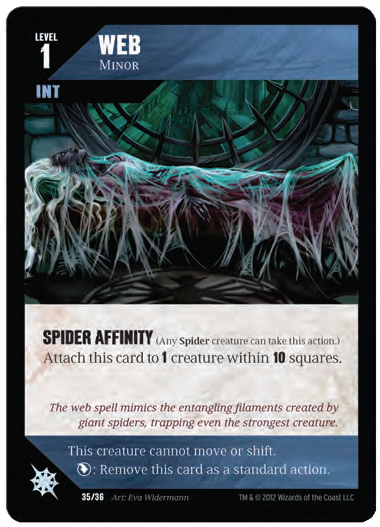 For example, if you want to play the “Web” spell order card to have one of your units shoot a web, you must play it on a creature who also has INT listed on their card, and is at least the same level or lower as the order card being played. 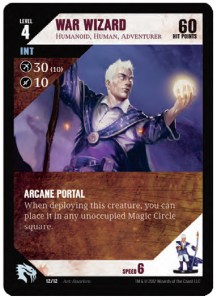 When you do an action, your unit taps (for those unfamiliar with magic, this basically means it is “spent” until it untaps – signified by turning the card to the side) unless otherwise noted on the card(s). Additionally, you can also have adjacent allies tap to aid another, effectively adding their level totals together to accomplish playing an order card as well. There are 3 action types Standard, Minor, and Immediate – each of them cause your creature to tap except minor, which you can perform as many of as you’d like, provided you have the order cards to do so. I should also note that moving does not cause a creature to tap, and tapped creatures can still move and perform minor actions. There is also no limit on the number of order cards you can play, or hold in your hand – but keep in mind these are a limited resource as when/if your deck runs out of order cards, you do not reshuffle the discard pile and start anew. Dungeon Command comes packaged rather nicely, there’s a designated spot for each miniature within the box as well as a spot for all of your treasure tokens, HP counters, and other various marker bits that come with each box. The dungeon tiles themselves are standard WotC fare, and interlock similar to the D&D board games but to tend to not fit very snugly. An easy fix for the tiles would be to lay down some rubber shelf liner (<5$ at walmart) and place them on top . The box acts as nice portable storage for your warband too, but it is a bit flimsy so don’t plan on it holding up for years if you’re toting it around a lot. The paint jobs on the miniatures are absolutely stunning, I’ve got a video below displaying the contents of both boxes that I hope you can bear to watch (I was recording with my phone so focus was tough) because it really shows off how amazing these minis look. I’m fairly certain none of this is new, no new sculpts, no new dungeon tile artwork, I’d even guess that most of the artwork on the cards is recycled from a D&D sourcebook, DDI article, or elsewhere. 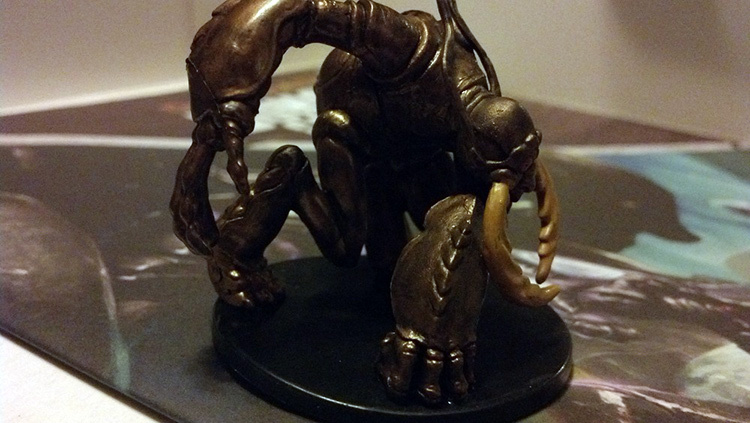 None of this matters though, because the production quality here is pretty good, especially considering the minis. The only gripe I have here is that the cards wear and tear easily, for being inspired by MTG they sure as hell aren’t MTG quality, so I’d recommend putting these in protective sleeves ASAP. I’d say that for a single warband retailing at 40$, the price here is debatable depending on what angle you’re coming from. If you’re a miniatures collector, it’s not that much pricier than the beholder or dragon boxed set that was released not too long ago. 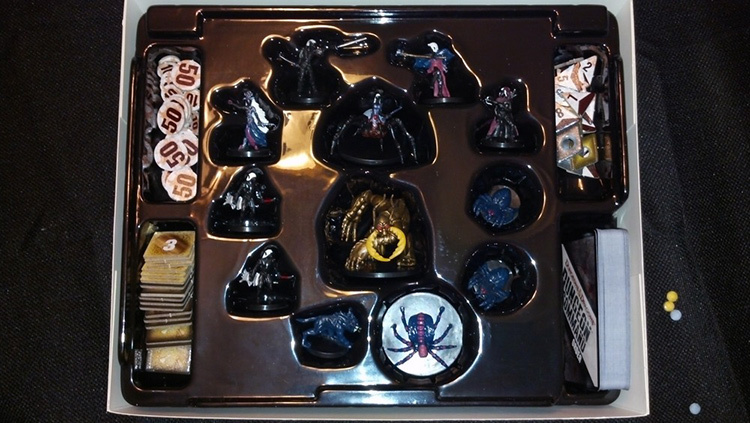 If you’re a D&D player who uses minis, they serve a double purpose here as well because of the dungeon tiles but there’s not really much to steal in terms of narrative for your game – this is standard Boregotten Realms stuff and not much more. If you own the D&D adventure system board games like Castle Ravenloft, Wrath of Ashardalon, or The Legend of Drizzt, then you’re definitely getting the most bang for your buck here. Each warband box comes with cards to use in the aforementioned games not only as monsters but you can also build an “ally” deck out of the cormyr box to add yet another element to those games. Being that I own all 3 of them, avidly play D&D, and love miniature wargames – Dungeon Command was an absolute joy to acquire. The play is competitive, strategic, and not very random aside from the cards you are dealt. I think the game has a ton of replay value, and there’s also rules for expanding the game to 3+ players in the back as well. For those of you wondering, yes one warband box is enough for 2 people to play the game, provided you follow the first time setup instructions in the rule book and divide your warband in half. This method is enough to give you a taste of what the game offers, but I don’t really think it gives you the whole picture – so if you want the full experience you’re going to need two separate warbands. 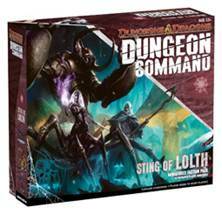 Luckily, they are a bit cheaper on Amazon – both Sting of Lolth and Heart of Cormyr are 29$ on Amazon with 5$ shipping (These were a bit cheaper and had free shipping not too long ago, unsure what happened). There’s also an undead and goblin (these are 26$ w/ free shipping) warband on the horizon for the game as well if you’re holding out based on themes. I’m going to snag the undead warband early and hope there’s a lich inside! Anyway, as always if you decide to pick these up, please use my links here so I can earn some change toward providing more of these reviews for all of you. That about wraps up dungeon command, thanks for reading, and I’ll talk to you all next time! The amazon info is dated already. They’ve raised them to $35.99 as of at least now. Thanks for the heads up, looks like amazon isn’t fulfilling these like they were and these are being sold by a third party. I’ll update the info! Does anyone know if there is any plans for smaller expansion products for this? Random mini’s and such? It makes sense to me for them to do so, but I have not seen any indication anywhere that there is a plan for this. Here is hoping, I suppose. Yeah, not sure yet. I guess we’ll have to wait and see. That does actually look pretty cool. the comparison the fourth ed. makes a bit of sense. When I first saw the game being played I thought it looked like the kind of thing that would lend itself well to a tactical combat game as opposed to a full RPG. As soon as money stops being quite so much an issue, I think I might splurg on this bad boy. The Amazon price of $29.30 includes free shipping of you take slow boat delivery. Wife and I played for the first time over the weekend and we really enjoyed it. I’m curious about future expansions. Will they just sell new warbands or are booster style expansions on the horizon? I like the idea of customization but when sold this way that will be a bit of a challenge. I really good review. Not that I needed the promotion. I also own all 3 Adventure Games, love D&D & Miniatures, and loved Magic. Played my first game last night. Really felt like I was losing until about the 3/4 point. Got all my creatures deployed and finally had enough to overwhelm the Dwarven Defender. Those things are nasty. I can’t wait to customize and combine the sets. The price is high, but the value is higher. Maybe I’ll try to catch you at GenCon and we’ll play a game. I have been teaching the game at the store I work part-time at and have been having a blast. Taught my friend and his two sons doing a 4-player game with just two sets. The boys 9 and 11 learned real well and totally enjoyed the game. It also helps they understood miniature games from playing the Star Wars mini line. I love the versatile nature of these sets, RPG, Adventure system AND this skirmish game makes it worth it to myself and all my friends. There is also an Orc set slated to come out as well.